So where are we in the grand scheme of things? » Regulars » Archive by Category "Dave P"
Last time I went up to the Etihad we came away with a win that took us into the Champions League. How times have changed since then. We did not invest in the team in the manner that many of our loyal supporters hoped for. Manchester City continued to invest Billions in buying every player on the planet and now they are a fixture in the Champions League (albeit not all that a successful one) whilst we are still a team trying to break into the top four. Our recent record against Citeh has been abysmal and history will record that yesterday was no different. In a few years time all anyone will see is that we were soundly beaten 4-1 but that does not really tell the story of this game. Four Penalties, two of which were missed, Spurs with 19 shots (only one less than City), and playing some inventive football at times. Some strange refereeing decisions contributed to what was a very watchable game of football and we can look back at the Soldado penalty miss (from one of the penalties that probably shouldn’t have been given) as a turning point of the ‘What if?’ variety. Shortly after that Soldado had another chance to level the scores as well but when you are up against the likes of Sergio Agüero you have to take those chances, and equally, you have to get the defensive side of the game right. So where are we in the big scheme of things? A quick look at the table shows us as only 2 points behind the current 4th place occupied by West Ham. Given that they play Citeh next week and we play Newcastle it is certainly not a major concern at the moment. We are 5 points down on the same time last season but interestingly 1 point up on the equivalent fixtures (because of the defensive performance at Arsenal) so again – not all doom and gloom. How close are we to being a good side and is Pochettino getting his message over to the players? At times yesterday our attacking play caused City’s defence a number of problems and I see no reason not to continue with that attacking line up. Soldado, whilst not scoring played a major part on most of what we did in and around their area. I see no reason why he should not get a run of games but I would like to see the service to him improving as well as the support. That said our full backs do need to learn when they need to get back quickly. Our turnaround speed (converting defence into attack and vice versa) is still too slow for my liking and it was noticeable how quickly City could change direction when needed. We need to emulate that. Defensively is where we have problems and this is where I think we need to be more settled in all competitions. Less of the ‘different ten outfield players’ in the Europa, and more of a settled team selection so the ‘partnerships’ can learn to work together. I’m not going to argue about the choice of Fazio over Vertonghen as that is a decision that Pochettino made, possibly for reasons that we know nothing about (performances/attitudes in training etc) and Fazio had probably done enough to earn that chance anyway in my opinion. Unless we appeal his card (which we should – that was never a clear goalscoring opportunity) that decision may be taken out of Pochettino’s hands anyway. Danny Rose has had a good season so far and I see no reason to change that as yet. Anyone facing the likes of Agüero on that form is going to struggle as demonstrated by the inept at times, showing from our Club Captain. 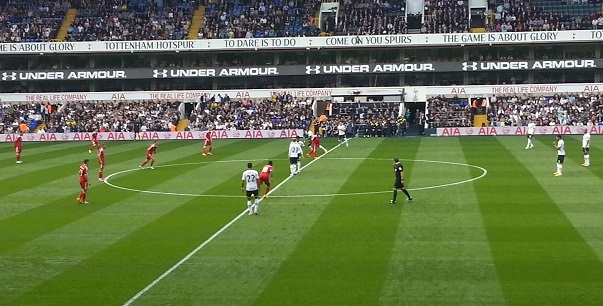 Eric Dier again looked composed and unfazed by the occasion and is a good stand in (or more) for Walker. No, the answer in my opinion is consistency in selection in the key areas from game to game using rotation to rest 4 or five players, not the whole team. On Thursday we play Asteras Tripolis in a game that we have to win if we want to avoid the necessity of getting a result in Istanbul in December and that is followed by games against Newcastle, Brighton and Villa. All should present us with the chance to get back on track and gain some level of consistency. Should we be worried yet? People tend to go to football matches for various reasons apart from the obvious one which is to support your team. We go to be entertained, We go to watch top players, we want to see goals, attacking football and to celebrate victories as we challenge for trophies. Today at White Hart Lane we got none of the above. The main object of the game is to put that little round thing in the big oblong things at each end of the pitch more times than your opponent. To do that you pass the little round thing around between yourselves, get it further up the pitch and using that technique know as shooting, you launch the little round thing towards the big oblong thing and hope the man standing in the way, doesn’t actually get in the way. This is known as scoring a goal. All the time your opponents try and get the little round thing from your possession and go in the opposite direction and do what you have been trying to do. Now today there was very little evidence of shooting, not much need for the opponents to get the ball off us (we kept giving it to them instead) and we certainly did not do a very good job of getting in the way when they actually got the ball on target. We enjoyed quite long spells of possession but did absolutely nothing with it. The defence looked as though they had never met each other and some of the midfield players didn’t want to let anyone else play with their ball. The quality of the passing was poor, The movement was poor, the quality of dead balls was sadly lacking and as for the high pressing game we are led to believe is the Pochettino way, there was very little of that on display. Right from the back to the front the whole team looked like strangers and whilst we must give West Brom. some plaudits for their resolute and effective defending, a team with players of our quality should at least have been testing the keeper occasionally. It is very hard to remember anymore than one serious shot at goal. That is unacceptable for what many reckon is the sixth best team in the country. Was this a hang over from a European game on Thursday? To be honest it is very hard to use that as any sort of excuse because this was a very different side to the eleven that started in Belgrade. Was this a sign of bad management? hard to use that as a reason either as it seemed as though the players just simply didn’t do their jobs and given Pochettino has expressed his anger at the performance this one was down to the players on the pitch. Part of the problem in my opinion, is that Pochettino is not sure what his best 11 is yet and is trying to find this out whilst playing two games a week in two different competitions. Different squads for different trophies is one approach to the demands of Thursday/Sunday football but is not the correct approach in my opinion. There has to be some rotation to balance the need to rest players (and tactical changes depending on the opposition must be taken into consideration as well) but too many changes can upset any rythym that may come from a settled side. Today , as I have mentioned, we looked like strangers and so some work needs to be done to find a settled core to the side. We need to get the defence sorted and assimilate the likes of Fazio and Stambouli into the team. The players have to learn their respective roles and apply some discipline to their games. Simple passes instead of looking for the eye of the needle ball. Getting players into space in dangerous positions and perhaps even shooting occasionally. Should we be worried yet? I don’t think so and I am sure supporters of Liverpool and United are asking similar questions. The season is only five games old so it is very early days but with two big games coming up (Forest and Arsenal) the players had better learn fast.